'Empires of Emptiness - Fortresses of the Sahara and the Steppe' uses extraordinary photography to show how, despite the seemingly limited 'value' of arid spaces and the significant logistical difficulties they posed, the conquest of deserts has often mobilised sizeable resources from some of the world's most notable empires. It looks at both the 'high politics' of these conquests such as the development of fortress lines across empty spaces as well as the more practical aspects of desert fortifications - construction, everyday life and relationships with local populations. Empires of Emptiness reveals the fascinating untold story of desert conquests. 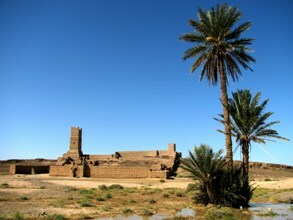 The exhibition is a visual and a historical journey which uses high-impact photography, in particular from the world-renowned archive of multiple award-wining photographer Alain Sèbe, to show vividly the 'nature' of the Sahara and the Steppe, which is essential to understanding the strategic and logistical challenges, which desert fortresses were supposed to help overcome. New forays into archival material in France and Russia, by the project's investigators Dr Berny Sèbe, principal investigator, and Professor Alexander Morrison, provide unique insights into decision-making processes, as well as the practicalities of building fortresses in deserts. Commenting upon Empires of Emptiness, Berny Sèbe observed; "The combination of high-impact visual and historical material offers a unique insight into one of the least-known areas on Earth, the environment and complex civilisations of the Sahara desert the Central Asian steppe. The exhibition's remit is to open up a whole new world to visitors. "Through the case study of desert fortresses, the whole story of imperial expansion unravels under our eyes. We wanted to give substance to the actual processes of conquest which underpinned the expansion of empires whilst examining why empires were sometimes driven towards conquering apparently useless territories, such as deserts," added Sèbe. The exhibition is the result of a University of Birmingham-led research project 'Outposts of Conquest' funded by the Arts and Humanities Research Council of England. For more information about the project visit http://www.bham.ac.uk/empires. 'Empires of Emptiness - Fortresses of the Sahara and the Steppe' is in the Footprint Gallery at Jackfield Tile Museum and is open every day between 10am and 5pm until 21st September 2016. Admission is free of charge.